This is a beautiful book designed as a textbook for how to recognize and deal with dragons. There are lots of interesting illustrations, tables for identifying dragons, jewels, etc., methods of capturing dragons, etc. There are three pull out sheets in envelopes, much like in the Griffon and Sabine books, one of which is a card for filling out like an ID card to show you are a dragon trainer. There are also a few pages of beautiful stickers in an attachment at the back. It's a fun, interesting and entertaining book for anyone who likes a little fantasy. Muy divertido, interesante y curioso. Está lleno de ilustraciones y datos curiosos, los dibujos son preciosos, y tiene detalles como sobres con hechizos, polvo de dragón, muestras de piel... xD ¡Es muy original! Una amiga tenía este libro cuando yo era pequeña y me dejó leer varias partes, pero no pude verlo entero. Me alegro de haber podido terminarlo por fin y creo que lo he disfrutado tanto como lo habría disfrutado entonces.Me ga gustado mucho y lo recomiendo a cualquier auténtico fan de los dragones. This book is such a cute companion to the full-sized version - Dragonology, by the same authors - as it gives readers a taste of what this series of books has to offer when it successfully covers a mythological topic. The writing may be a bit juvenile for adult readers (hello, it is for kids), but I still really appreciate the time and effort that went into the design of this book, which balances text and artwork quite well and succeeds in a pleasing overall aesthetic. It's also quite cute that they chose to make this pocket version more than just a miniature representation of the full-sized edition, and tackled the subject matter in the form of a student's handbook - giving basic information about dragons, assigning "homework" for each thematic topic, and acting like a field guidebook rather than a tome of information (which certainly would not have worked in this small format). Final verdict: a surprising delight that is sure to engage young readers and remind adults of their childhoods. Lovely book with wonderful drawings and creative descriptions about everything to do with dragons (their dung, their general color/shape, their habits, their language, and details about how to go about studying dragons). 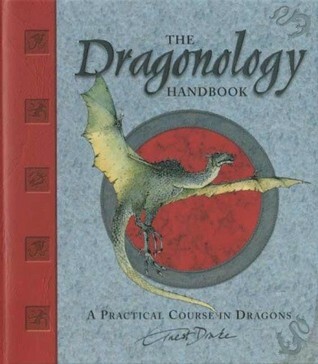 The book is set up as a workbook for new students to Dragonology. It includes lessons, tests, and general information for the student. The book does a good job of presenting dragon information as though it's a class available to everyone. I particularly loved the little 'secret' pockets in the book, that you opened up to pull out letters/maps, etc. The book also comes with a huge number of dragon stickers. A follow-up to 2003’s Dragonology: A Complete Book of Dragons, this handbook for dragon enthusiasts is replete with drawings, charts, codes, riddles, and all the information one could want on various species of dragons. Their appearance, diet, habitat, and forms of attack are listed, along with instructions on how to write in dragon script, perform dragon magic and dragon first aid, and more. Printed in attention-getting faux antique style, this book will be in high demand from elementary students who may get so caught up in the dragon world that they forget it’s all fantasy. Dugald A. Steer Ernest Drake - Until recently, Dugald A. Steer worked as an author and editor at Templar Publishing. He is the writer behind Candlewick's widely acclaimed New York Times bestsellers, DRAGONOLOGY, THE DRAGONOLOGY HANDBOOK, and EGYPTOLOGY, as well as the forthcoming EGYPTOLOGY HANDBOOK. Dugald has now given up his editorial job to concentrate on writing full-time, especially more books with "ology" in the title. Dugald Steer lives near London and has far less free time than he imagined he would.